His Majesty The King graced the closing ceremony of the 11th and the last session of the Second Parliament earlier today. Speaker Jigme Zangpo thanked His Majesty The King for the peace and tranquility that the people and the country enjoy under His Majesty’s dynamic and benevolent leadership. During the 15-day session, the parliament endorsed the Interim Budget for the Financial Year 2018-2019 and the Supplementary Budget Appropriation Bill 2017-2018 as Money Bill. It ratified the Double Taxation Avoidance Agreement between Bhutan and Bangladesh. The session also saw the Prime Minister present the final report of the 11th Five-Year-Plan. 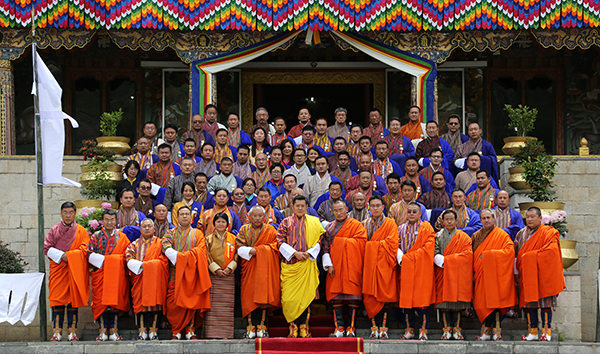 The closing session ended with the Members of Parliament offering Tashi Moenlam to His Majesty The King.